Cork must win in Armagh on Sunday. Sean Powter starts for Cork for their trip to Armagh. 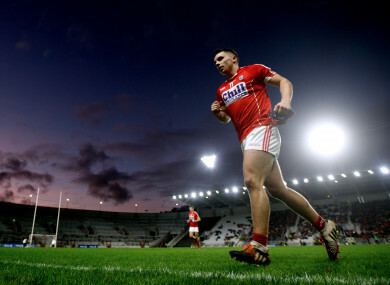 CORK HAVE HANDED Sean Powter a first start in 14 months as they bid to escape relegation from Division 2 in Sunday’s final round of the Allianz football league. Cork must win in their trip to face Armagh in the Athletic Grounds while hoping for a Tipperary win or draw in their last game with Clare in Thurles. Powter has not started for Cork since suffering a hamstring injury in January 2018 in a league tie against Tipperary. He made his comeback last month against Meath when he scored a goal, while he also came off the bench in the recent ties with Tipperary and Donegal. The Douglas man comes in at centre-forward in one of three changes from that loss last Saturday against Donegal with Clonakilty’s Mark White starting in goal and Fermoy’s Tomas Clancy named at centre-back. Nemo Rangers duo Luke Connolly and Micheál Martin are both out injured while St Finbarr’s defender Sam Ryan drops to the bench. Throw-in at the Athletic Grounds on Saturday is 2pm. Email “3 changes for Cork as Powter to make first start in 14 months in relegation battle on Sunday”. Feedback on “3 changes for Cork as Powter to make first start in 14 months in relegation battle on Sunday”.